An era of continuous disruption is changing, forever, how we design, manufacture, and consume. What Are Three Ways the Brain Creates Meaning? Can Kids Innovate Better than Business Grads? New disruptive technologies are permanently changing the way we conceive, design, manufacture, and sell products. To veteran innovator Tom Wujec—Autodesk’s former ‘Chief Disruptor’—this revolution isn’t intimidating, but an exciting opportunity. As each industry is forced to adapt and learn new skills, they’ll need a guide—and Wujec is our most valuable. In his latest book, The Future of Making, he offers a gorgeous, full-color, and transformative guidebook for those who want to imagine, design, and produce into the 21st century. 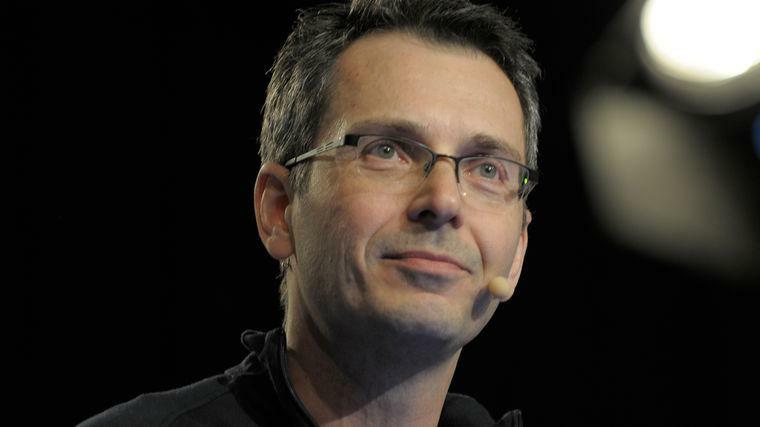 As Chief Disruptor at Autodesk—the Oscar-winning industry leader in 3D computer animation technology, and one of the world’s largest software companies—Wujec worked with a diverse range of clients, from the largest automotive and consumer product manufacturers to the visual effects and gaming companies. He’s celebrated for his talks on innovation: why it matters, why it is a vital engine of economic growth (especially today), and how to foster it within any organization—from plucky startups to billion-dollar legacy companies. Working closely with Fortune 100s, he’s counted on to create innovation practices at all stages, from strategic planning to design and implementation. Now—and with his latest book The Future of Making—he brings his vision of disruptive innovation to global audiences, demonstrating how the entire process of imagining, iterating, constructing, manufacturing, distributing, and selling products has changed—unprecendentedly. He’s also been a leading advocate of making work visible within a company, of transforming ideas into images that enhance clarity and engagement, leading to intelligent and successful new products, services, and processes. Thanks to Wujec, revolutionary companies unafraid of the disruptive landscape are creating profound new ways of understanding their employees, customers, markets, channels, and products. He has brought several award-winning products to market, and has published a number of influential books, including Return on Imagination, Five Star Mind, and Pumping Ions—works which have been translated into over a dozen languages. His book, Imagine Design Create, was released at TED 2011 to rave reviews. Every industry is becoming computable. As digital technologies automate more of what we do everyday, the nature of our work—and our livelihood—will undergo a radical transformation. This keynote explains, provokes, and inspires. It clearly explains how three classes of technology—tools that capture, compute, and create—are propelling the evolution of companies. It provokes by shining a light on the fast approaching future, illustrating how the idea of value is unfolding in unexpected ways. And it inspires, showing how individuals, leaders, teams, and organizations can take advantage of emerging digital tools to not just automate, but to augment their work, unleashing superpowers that scale impact and deepen fulfilment. Wujec also shares first-hand stories of how manufacturing, construction, pharma, healthcare, education, and financial organization are reimagining work as they disrupt their industries. The future of work has never been more relevant. As technology continues to accelerate, we all need to understand how to can take advantage of digital tools, rather than be replaced by them. This immersive, high-energy, and visually rich workshop helps you map the future of your work by charting how digital tools change the nature of value and where your specific industry and skills fall into this largely uncharted new terrain. This workshop turns what can be complex and overwhelming about new tech into simple, clear, and manageable action. Through collaborative brainstorming and value/technology mapping, you can survey the technologies that matter now, clarify their impact on your business, and discover how to dramatically augment—not automate—the talents that matter to you. Technology is moving at an extraordinary rate. But at the leading edge of innovation, designers are working in concert with it, as partners, to augment our intelligence and capabilities. As technology becomes cheaper, more powerful, and more widely available, we’re now witness to a democratizing force that’s letting us tackle the most challenging design problems on the planet. We owe much of this momentum to a new disruptive creation process called RIP, MOD, FAB. In this mind-expanding talk, Tom Wujec describes how we are now ‘ripping’ the world to get an ever-more accurate digital picture, ‘modifying’ these models with advanced simulation tools, and ‘fabricating’ the net result in physical reality—a totally new way to imagine, communicate, manufacture, and sell physical products, from cars to shoes, movies to skyscrapers. Think of it as a digital ‘read, understand, and write’ approach to design. And when it touches an industry, Wujec says, that industry is never the same. Thus it has untold repercussions for every sector: manufacturing, real estate, media, transportation, retail, education, finance, entertainment, healthcare—the list goes on. This unprecedented development will produce entirely new business models. It will demand new skills and team capabilities. It’s downright scary. But there’s incredible potential for those who can wield it properly, who can understand and frame the changes. It’s an incredibly exciting time to be a designer, a producer, and a consumer, and Wujec serves as an invaluable guide to this burgeoning world. In this talk, chief disruptor Tom Wujec will illustrate the dramatic transformation Autodesk has made to the cloud—from delivering software products to providing comprehensive team-based service solutions. Being “Born in the Cloud” means much more than just off-loading applications to remote servers. Cloud computation creates fundamentally new value propositions, business models, and infrastructure solutions. It equips customers with new ways to do their work. With fascinating examples, Wujec shows how manufacturing, construction, pharmaceutical, finance, media, entertainment, and other industries are being upended in surprising and powerful ways by cloud computing—and what that means for sales. Tom Wujec's Marshmallow Challenge is a design experiment that reveals deep lessons about teamwork, collaboration and project management. It sounds simple - teams try to build the tallest freestanding structure they can out of 20 sticks of spaghetti, 1 yard of tape, 1 yard of string and a marshmallow. What makes it difficult is the need for teams to organize, prototype and build the structure in the short time frame. The results are astounding: children tend to outperform MBA students, due to their ability to redesign on the fly rather than plan a rigid structure and execute, even if the structure is doomed for failure. In this interactive keynote and workshop, Wujec brings his audiences through the Marshmallow Challenge from start to finish, helping groups of all types discover the value of team work and the power of visualization. Why is innovation so important to growth? And how can we innovate more effectively and efficiently? In this customizable talk, Wujec answers these questions through striking images and practical lessons learned from his award-winning work with Fortune 100 companies. Wujec's talk is a rare chance to see innovation at work—to see how the great companies come up with new ideas and bring them to market. Wujec shares proven approaches that encourage exploration, customer engagement, prototyping, and innovation testing. And importantly, he illustrates simple ways to measure the return of innovation success. he leaves audiences with principles that any company can use immediately: principles whose brilliance lies in their powerful simplicity. Innovation speaker Tom Wujec’s “Marshmallow Challenge” is a design experiment that reveals surprising lessons about teamwork, collaboration, and project management. Tom’s experiment sounds simple enough: teams try to build the tallest freestanding structure they can out of 20 sticks of spaghetti, 1 yard of tape, 1 yard of string and a marshmallow. What makes it difficult, though, is the need for teams to organize, prototype and finally build the structure in the short time frame. The results are astounding—children tend to outperform MBA students, due to their ability to redesign on the fly rather than plan a rigid structure and execute, even if the structure is doomed for failure. Through his “Marshmallow Challenge,” which he has presented at TED, Wujec has helped countless groups learn the value of true collaboration. And unlike a lot of other teamwork exercises, it’s actually fun! Kindergartners Outperforming MBA's: Tom Wujec's "Marshmallow Challenge"